A personal guide for visiting local favorites in ATX. Swing by, and then don’t miss Wanderlust 108 on November 10! Chill with Zuzu and Ebony Smith (aka the Ghetto Guru, read more about her here) at her Wanderlust 108 pre-event to get ready for the main squeeze on November 10! For more info about the 108, click here. We have several types of tickets available this year, something for every budget. Snag a Practice Ticket for entry to the yoga and meditation portions of the event, as well as the Kula Marketplace. Entry to other bonus activities and the 5K are included with either the 108 Ticket, the 108 Ticket Package, or the premium WAN(DER)LUST Package. Have a spot you’d like to see on this list? Reach out to us on the Austin 108 Facebook event page and let us know. In the heart of Texas is a weird little gem of a city called Austin. It’s known for it’s diverse culture, thriving creative community, scrumptious local eateries, and a whole lot of southern hospitality. Austin is alive and vibrant with a much to see and experience, so we’ve created a list of some of our most treasured spots around town. Whether you’re coming for a getaway weekend with your lover, a bachelorette party, birthday celebration, or just to experience the local scene, Austin has something to offer for all types, and its magic is felt by everyone who visits. Bouldin Creek Cafe is an Austin favorite and for good reason. With tons of veggie and vegan options, a wide variety of coffee, tea, and pastries, and the some of the best breakfast tacos in town, we couldn’t leave this off of our list. Before you and the girls embark on your weekend journey, fuel yourselves with a healthy local meal. If it’s your first time visiting this hippie haven, try the Vegan Blueberry Cornbread with agave for dessert and check out on the outdoor patio. Barton Springs Pool is a natural spring that flows in the heart of downtown with an average chilled temperature of 68-70 degrees all year round. For $3 you can take a dip, sunbathe on the grassy hill, show your skills on the diving board, and experience some of the cities best people watching. Note that the park does not allow food or glass containers, and definitely no coolers. Bring your suit, a towel, and water to stay hydrated. If you’re adventurous, bring some goggles and search for the springs endangered Salamander that is housed in the bed of the springs! A Night on the Town : Rainey St.
Rainey St. is a downtown neighborhood filled with local bars, food trucks, live music, and outdoor games. There is truly something for everyone on Rainey st. and it you visit on a weekend night or even for Sunday Sunday, you’ll be surrounded by locals and visitors alike. Check out live music at Icenhaur’s, play lawn games at Lustre Pearl, and grab a deep dish pizza at Via 313. Parking can be tricky, so we suggest getting a ride share and then strolling on foot to see what Rainey has to offer. Learning meets fun at this local children’s museum and exploratory experience. The Thinkery believes in the importance of developing future generations of creative problem solvers through science, technology, engineering, arts and math (STEAM). This is one of Austin’s most renowned experiences for the little ones and is entertaining for the entire family. This art space is not only for kids to creatively express themselves, but the entire family. Smudge is a creative sanctuary with private and public classes, kids camps and events. Make sure to check out the splatter room! Owned by two young Austin women with a thirst for creativity and self-expression, this is a spot not to miss while visiting ATX. This toy store is beyond anything you’ve ever seen. Toys and novelty items as far as the eye can see, even the ceiling is adorned with vibrant color and one-of-a-kind toys. Toy Joy has been the one stop shop for gifts in Austin since 1987 and is a wild experience for all. Bring the whole family for an afternoon of imagination and shopping. If you’re on the hunt for some gifts to bring back home, this is our #1 suggestion with a little something for everyone. The HOPE Farmer’s Market occurs every Sunday from 11-3pm with local farms, artisans, live music, yoga, and activities for the whole family. Located in East Austin, this is one of the longest running farmer’s markets in the city. Have some fun in the sun and support local farmers! Grab a local kombucha and breakfast taco while you shop and doggies are always welcome! A new addition to the local night life scene is Native Hostel, an upscale hostel with full kitchen and bar. Classified as an “Experiential Hostel” because of it’s weekly rotating events. Pop in anytime for a bite to eat, a refreshing cocktail, or on a Friday or Saturday night for a fancy rage fest. You may stumble into an art show, live music, a dance party, or all the above! You may have heard of Austin’s “Dirty 6th Street”, but we suggest moving west down 6th to the district known as, “West 6th”, a wild place for those who like to party like there’s no tomorrow. You’ll find yourself surrounded by local bars, clubs, and restaurants with an array of attractions at each one. Make sure to check out Kung Fu for some free video games on Sunday and Green Light Social or Concrete Cowboy for a night of dancing. Dinner before going out is always a smart idea, so grab a burger at the Austin landmark, Hut’s Hamburger or local favorite, Irenes. Dance the night away at this dark sweat fest in East Austin. It may not sound appealing, but there’s something magical about dancing like there’s no tomorrow like sardines in the dark dance floor of the Hotel Vegas. This is the place to go if you’re in need of letting loose and some detox/retox action. Outside patio for those who are looking for fresh air and picnic tables to connect with new friends and an intimate dance floor inside for those who want to rock out. Grab a Lone Star and catch a night of hip hop or a 90’s classics with local DJ’s. A local hangout and one of our top choices for a night out for all of you party animals. The Austin Poetry slam is a long time standing spoken word event every Tuesday at the Spiderhouse Ballroom on UT campus. The venue is embellished with some of the most random decor we’ve come across, which makes it incredibly fitting for the Austin scene. Show up early to get a seat, this event packs out every week. Just $5 for your entry, all ages welcome, and you’ll have your soul cracked open by these incredible poets. Full bar and food on-site, so it’s a one stop shop on any given Tuesday. If you’ve looked up “things to do in Austin”, then you’ve seen the HOPE Outdoor Gallery, a community paint park located at 11th & Baylor St. in downtown Austin, TX. This educational project was ofﬁcially launched in March 2011 and is the only paint park of its kind in the USA. Leave your artistic mark on Austin and lay down some spray paint! The park is open to everyone to paint, but make sure to send an email to murals@hopecampaign.org to register beforehand. Swing by Jerry’s Artarama to grab your paint supplies. If you like art, you’ll love this gallery located off of South 1st, one of Austin’s weirdest neighborhoods. We love AFTP because of it’s dedication to promoting the Austin art community and featuring 120+ local artists. You’ll find original artwork, sculptures, ceramics, jewelry, home decor, cards, prints, and fashion pieces. Hop around S. 1st for other boutiques and shopping experiences. Bouldin Creek Cafe (see above) is a short walk away. Grab lunch and check out local art in this funky Austin OG neighborhood. 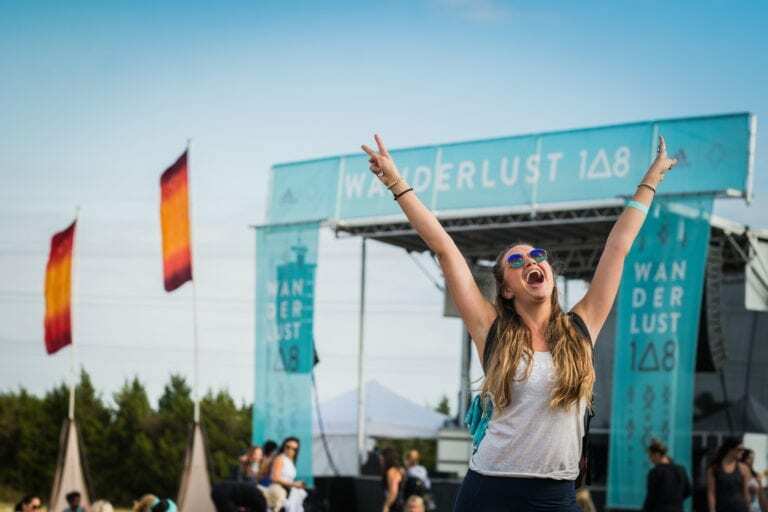 Join us at Wanderlust 108 Austin!